When the beans are in their last stretch of cooking, heat 2 cups of water in another saucepan. While waiting for the water to come to a boil, rinse the tapioca pearls in a fine-mesh strainer under running cool tap water until thoroughly wet. Drain and let sit a minute or two for the pearls to absorb surface water, then add to the boiling water. Reduce heat and stir frequently until the pearls clear (8 to 10 minutes). 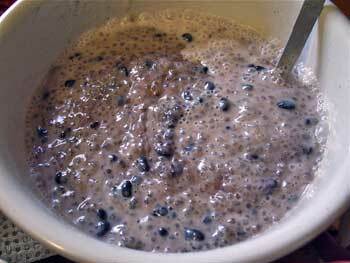 If the mixture becomes too thick, add a little more water to help cook the tapioca until all the pearls are cooked through. Make a coconut sauce by combining the coconut milk, 1/2 cup sugar and 1/2 teaspoon salt in a saucepan. Heat and simmer about 5 minutes to thicken slightly. 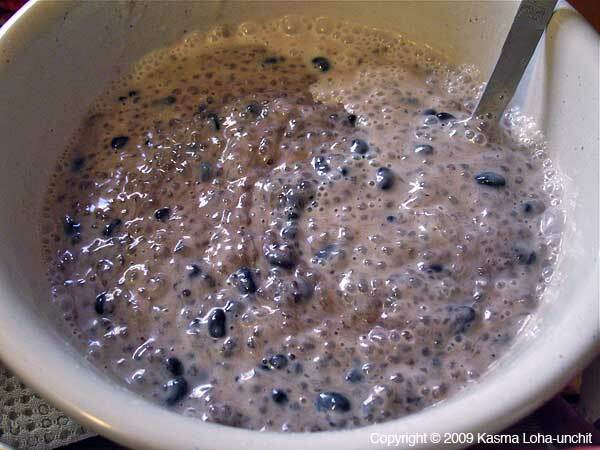 When both the beans and tapioca are cooked, mix them together and pour in the coconut sauce. Stir to blend. Serve warm. Makes 6 to 8 servings. As with many Thai snacks and desserts, the coconut cream topping is salty sweet to contrast with the bottom layer of pudding which is sweeter. The saltiness makes the cream taste richer; the cream is not meant to be eaten by itself, but together with its sweeter companion. 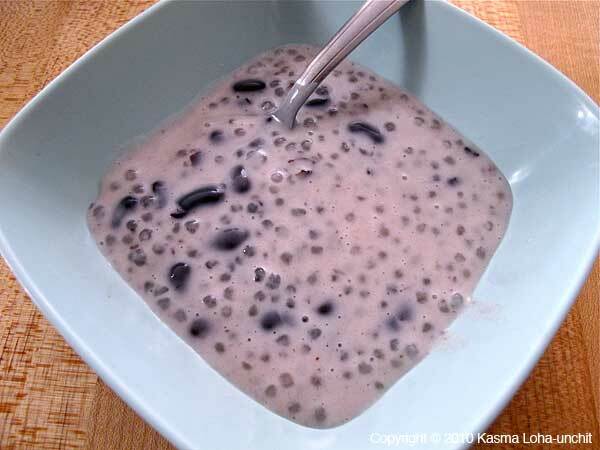 See Also: Kasma's Blog entry on Tapioca – Sagu (or Sakoo). Kasma teaches this recipe in the Evening Series Advanced Set A-3. *Because the Thai language has its own script, there are different ways of transliterating Thai into English. The more phonetic version is Sahkoo Tua Dtam; the more usual spelling is Sakoo Thua Tam. See A Note on Thai Pronunciation and Spelling.